The session was titled "Why Design Thinking Will Save KM". I was reading “design thinking” and my brain was registering “systems thinking” until the day of the event. Essentially, we’re talking about a different way of thinking about KM. 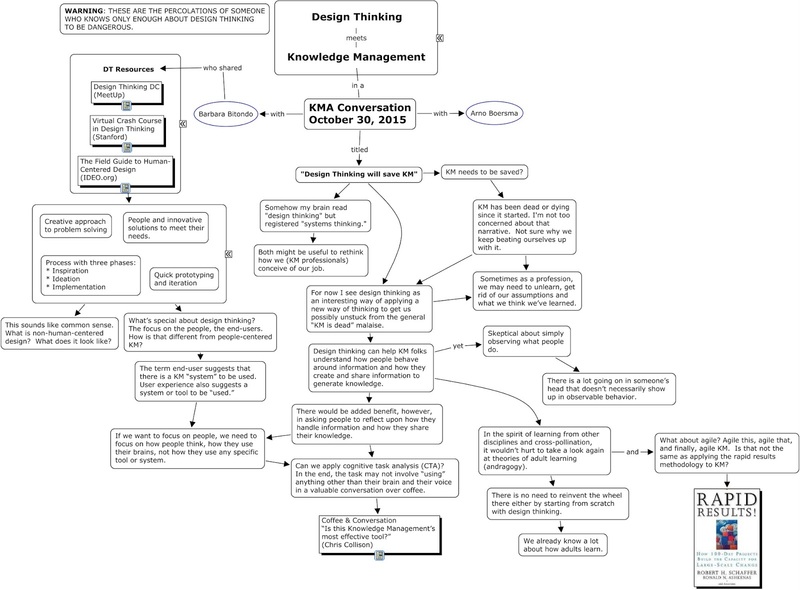 KM could benefit from both design thinking and systems thinking if they were integrated in some way. That will require more percolations. For now I see design thinking as an interesting way of applying a new way of thinking to get us possibly unstuck from the general “KM is dead” malaise. KM has been supposedly dead or dying for as long as I've been in this field (close to 20 years) so I'm not too concerned. Sometimes as a cadre of professionals, we may need to unlearn, get rid of our assumptions and what we believe we’ve learned. What’s special about design thinking? The focus on the people, the end-users. The term end-user suggests that there is a KM “system” to be used. User experience also suggests a system or tool to be “used.” If we want to focus on people, I think we need to focus on how people think, how they use their brains, not how they use any specific tool or system. 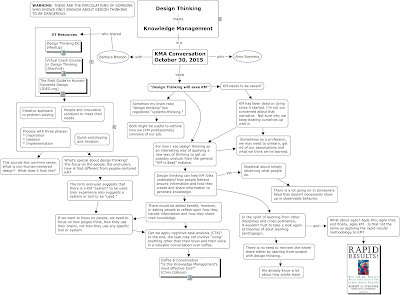 If design thinking can help KM folks understand how people behave around information and how they create and share information to generate knowledge, that’s great. I’m a little skeptical about simply observing what people do because there is a lot going on in someone’s head that doesn’t necessarily show up in observable actions. There would be added benefit, however, in asking people to think about how they handle information and how they share their knowledge. Can we apply cognitive task analysis (CTA) without making it all about how they navigate a website? In the end, the task may not involve “using” anything other than their brain and their voice in a valuable conversation over coffee (See Chris Collison’s article “Is this Knowledge Management’s most effective tool?”). In the spirit of learning from other disciplines and cross-pollination, it wouldn’t hurt to take a look again at theories of adult learning/andragogy. There is no need to reinvent the wheel there either by starting from scratch with design thinking. Agile this, agile that, and finally, agile KM. Is that not the same as applying the rapid results methodology to KM? Here is the corresponding map for this post. Unfortunately, I can only publish the maps as images at this time and therefore the links embedded in the map will not work. Click to open in a separate window and enlarge.